Duration is 12-13 hours from pickup to drop-off. Lunch and all admission costs are included. Pickup from the hotel lobby will be at 6am. From here we will venture up 3.5 hours to the Grand Canyon. This will be a guided and narrated tour of local history and information. The vehicle will be a comfortable SUV for small groups. Upon arrival at the Grand Canyon we will spend a total of 3 hours in the National Park. 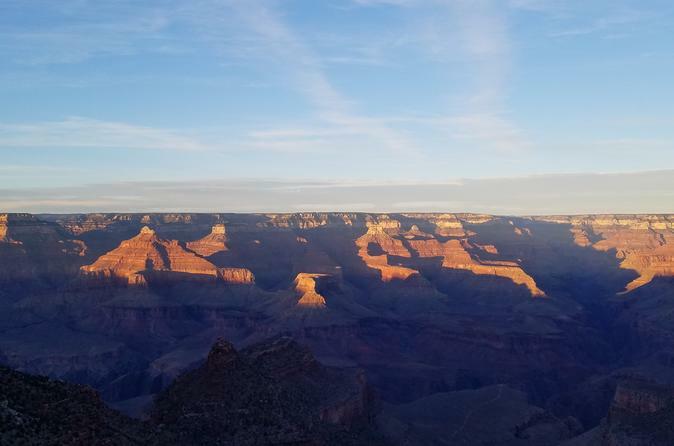 Here we will see two of the most prominent viewpoints and you will have time on your own to check out the Grand Canyon Village. We will also go to lunch before we depart. We will then venture to Sedona. Once arriving, we will grant you time to check out the quaint uptown Sedona area, rich in curios and local artwork. We will spend 1 hour to 1.5 hours here depending on preference. On the way out of town we will check out some local redrock photo sites. Then we will venture back to the hotel for departure.